Stumbled across something interesting today regarding how the body stores (and loses) fat. As for losing fat, it’s doable, but our bodies make it hard to. (Not that I had to tell you that). But get this, the fat hormone produced when fat cells shrink is produced more rapidly than the actual shrinkage rate. This means our brains are getting the message that we’ve lost more weight than we actually have. Talk about sabotaging yourself! 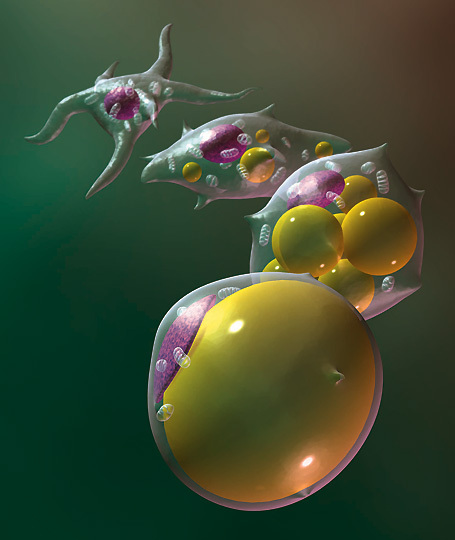 And here’s one more sobering morsel to chew on…like all cells, fat cells shrivel up and die, BUT the number of them in our bodies at any given time always remains constant. Obviously, evolution is the reason our bodies are hardwired to hold onto fat. Food wasn’t so plentiful back in our hunter/gatherer days and our bodies had to develop a way to store energy for those times when a meal wasn’t forthcoming. Who knows…maybe millennia from now getting rid of that excess fat won’t be as hard as it is now! This entry was posted on February 3, 2011 at 6:25 am and is filed under Obesity, Weight Loss, Weird Stuff. You can follow any responses to this entry through the RSS 2.0 feed. You can leave a response, or trackback from your own site.